Manna Bible Institute has entered into agreement with Lancaster Bible College to provide LBC classes at Manna’s Philadelphia campus for well-qualified graduates of Manna’s Standard Bible Diploma course to receive Bachelors’ degrees in Biblical Studies, General Studies, and Human Services (on campus) or Bachelors’ degrees in Business Administration and Criminal Justice (online). Under this agreement, Manna graduates can continue their studies here in Philadelphia, although the resources of LBC in Lancaster are available to all students in the program. Lancaster Bible College faculty will be on our Philadelphia campus to teach selected courses. 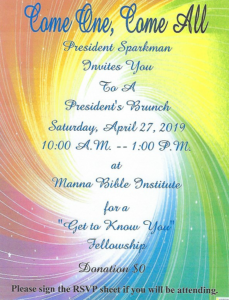 Advanced standing in the undergraduate degree programs will be granted to qualified Manna Bible Institute students and graduates. For further information concerning the advantages of the accelerated undergraduate programs (Pathways), click here to be connected to the Lancaster Bible College/Philadelphia website.